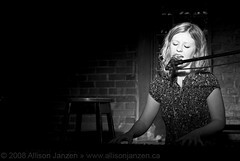 This week we will look at Toronto singer-songwriter Darrelle London. For those that enjoy Darrelle’s music (and i guaranty that a few of you will) , her twitter handle is @darrellelondon. The first tune I have selected is titled Bad, and is an interesting song in the style of Hayley Sales or Eliza Doolittle. Very catchy tune. This next song “Works Out Fine” showcases her skills in songwriting. A very stripped down tune, just her and the piano, and some quirkiness. I very much enjoyed Darrelle’s music. Please check out her home page. This entry was posted in Canadian Music, Pop and tagged Canadian Music, Music, Singer-songwriter. Bookmark the permalink. Good potential, I’d like to hear her as she gets older. Good comparison. I see that now distinctly. I tried to find her material somewhere and couldn’t. So I asked and she tells me that she has a release of her material on April 3 in iTunes. I’ll ask her if it’s a worldwide or Canada only release.